The odds are that if you’re from the Sacramento area, you’ve experienced at one point in your life a barbecue that went from fun to terrible in less than 30 seconds because of the Western Yellowjacket. This stinging insect is deserving of its reputation as a summer day ruiner. 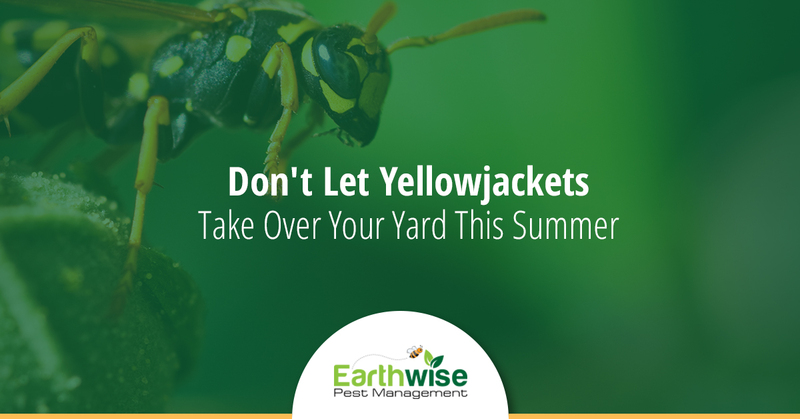 Don’t let the Western Yellowjacket ruin your barbecues this coming summer, instead, call us at Earthwise Pest Management and ask about our residential pest services before the yellowjackets decide to set up camp in your yard. Yellowjackets are often mistaken for bees because of their yellow and black coloration, but upon closer inspection, yellowjackets may be much different than their honeybee cousin. Yellowjackets are relatively small and can be black and yellow, or black and white. The two most noteworthy factors of telling a yellowjacket from a bee would be the waist size and the wings. Compared to a bee, the yellowjacket has a small and defined waste separating the abdomen from the thorax and the wings of a yellowjacket are long and fold laterally when the insect is not flying. Arguably, one of the worst parts about the yellowjacket is where they live. Yellowjackets like to nest in the ground, making their paper-like nest out of fibers from trees and shrubs in whatever holes they can find. The location of their nests is a major reason why they are so disruptive in the summer months. You could be playing catch in the backyard and step on the ground above the nest triggering an aerial attack from an entire yellowjacket colony. That doesn’t sound fun at all. There are a couple things that you can do to potentially keep yellowjackets from building a basketball-sized nest in your backyard, but once a nest is established you practically have a landmine in your yard, just waiting for someone to step on it. One of the most effective forms of yellowjacket prevention is to never attract them to your property at all. Yellowjackets are foragers, and if foraging adults find a steady source of food in your yard, they might just move-in. You can clean up your yard by making sure that all food and trash receptacles are firmly sealed, as well as cleaning up any spilled food and drinks. Depletion traps are extremely variable in success. For instance, if you leave a trap out in your yard and it traps foraging adult yellowjackets, that could be considered a success, but if there is a nest in your yard, the trap simply won’t be enough to deplete the colony. Yellowjacket traps often are plastic containers that are baited with chemicals or food that do not allow the insect out once they have entered in search of the food. While this is the most successful form of yellowjacket management, it is also the most dangerous. In order to destroy a nest with chemicals, you must get extremely close to the nest, increasing your chance of getting stung. Instead of bundling up in all the clothes that you can find and going SEAL Team Six on the yellowjacket nest, just give us a call and we will take care of it for you. At Earthwise Pest Management we are dedicated to being the best residential pest control company in the Sacramento area. If you ever find yourself with a yellowjacket infestation in your yard, give us a call and we will send out one of our professional pest exterminators. If you have any questions or concerns about your pest infestation, or if you want to talk about pest control prices, contact us today.